Smart casual little outfit. My top is actually a jersey dress which i bought last year, i don't really like how it sits as a dress, i don't find it flattering on my body shape because i have wide hips. So, i've tucked it into these denim shorts and made it baggy. I'm really not a fan of skin-tight clothing at the moment, so baggy it is! Outfit looked really boring so i decided to wear some knee high socks over my tights to give a suspender look,(i still really need to buy some suspender tights!) + an oversized blazer. The blazer is a size 14 as it was the only one in stock when i bought it, its absolutely huge on me, but it doesn't look half bad. For me, i'm actually wearing a hella lot of jewellery. The full works, earrings,rings, necklace and bracelet, probably went OTT but ohwell. You can't see my earrings but there silver balls, my 'peace' bracelet just because its major cute. I'm wearing 3 rings because my fingers just felt all bare and i've got my little clock necklace on. I had therapy this morning, which went quite well. I'm really not one to talk about how i feel, i like to bottle things up and not bother anyone with my problems. I don't think a lot of myself you see. Me and mother popped to the shops after to get some bits and pieces and i picked up these. Barry M lipstick 153. 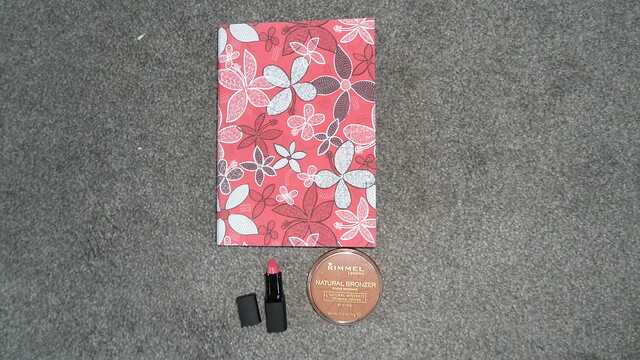 Rimmel Natural Bronzer 025, and this little notepad. My lips feel boring at the moment, i've been wearing lip balm instead of adding any colour, so i thought this natural(ish) colour would be perfect, it's really nice actually, i like Barry M's lipstick range. I had to buy this bronzer today, i ran out of my Models Own blush the other day so have been settling for this bronzer in the mean time. But me, being my clumsy self dropped it today on my wooden floor and it broke into a million little pieces. DAMMIT, there wsn't much left and it was going everywhere, so i just bought a new one. So at therapy today, i was told to go away and buy a notepad. I have to write down 3 positive thoughts about myself daily and if i get complimented to my face i have to write it down. I'm like the most negative person i know, so this is in an aim to hopefully build my self confidence, self esteem and make me more positive. Fingers Crossed i suppose. Love the dress worn as a tee! You don't have wide hips at all from what I can see of previous posts! You looked beautiful in the maxi dress btw! Also I've noticed you're pretty hard on yourself in posts like you mentioned you are quite a negative person but you've so lovely! You need to believe in yourself, you're a beautiful, intellient lady! the blazer doesn't even look like it is that size. but it looks so nice on you! and i love the socks over tights look, i was sporting that all winter, because just tights was wayyy to cold! 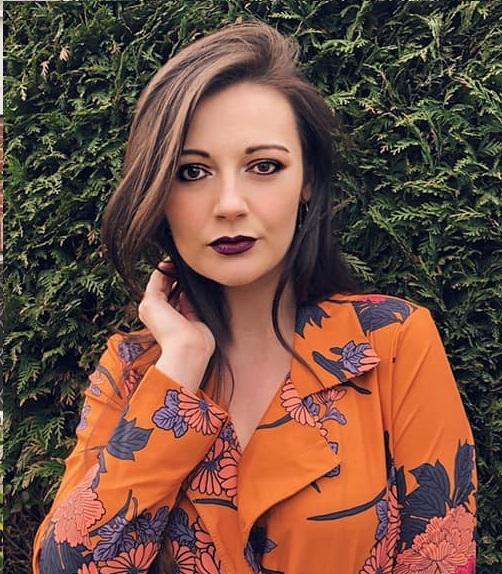 One for your notebook- YOU ARE GORGEOUS and your blog is great!! Don't know if it counts over the net instead of face to face but print this off and stick it in! I love that shade of grey, I wear it far too much! 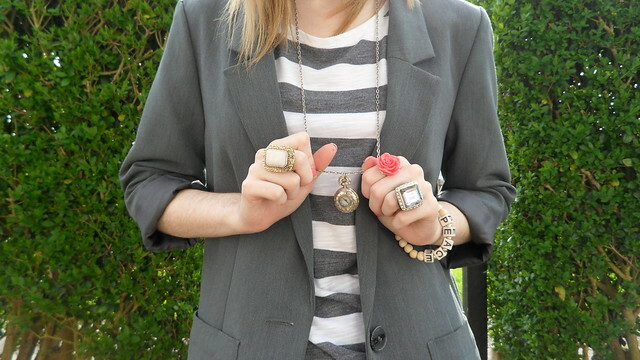 Blazer + top + amazing jewellery = very cute indeedy! 3. Courtney has amazing legs, which make Emily extra jealous. Fantastic outfit!! :D love the location! good blog! I'm following! 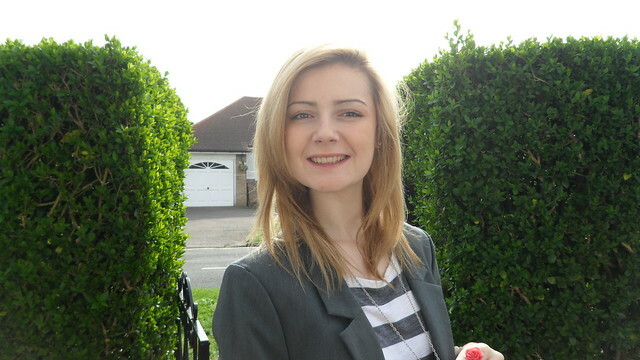 Cute outfit, love the photos - you look so sweet! 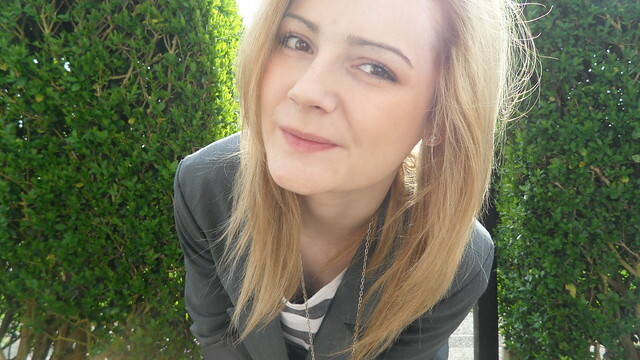 Really like your blog and just followed you - wanna follow me back? Lovely rings! Love your socks too. I think I'm going to try the notebook idea, I've been extremely negative since starting college and it's not getting me anywhere. love the tights/socks and demin shorts combo. your whole outfit is fab. Cute outfit, loveeee the peace bracelet! hope you will feel better very quickly! very cute look!! The socks over the tights are the perfect touch, which you pull off amazingly. i've been loving blazers with shorts. if i could wear shorts to work, i'd definitely rock this! nice way to put that dress to use! fabulous jewelry, too! Very nice classic outfit. I'm pretty partial to stripes and the blazer definitely revs up its casualness.